These two world-class pezzottaite pieces are from Madagascar. This is a truly rare collectible gem that was only identified in 2003 by Dr. Federico Pezzotta in Madagascar at the Sakavalana Mine. A newcomer to the gem world with extremely intense and saturated colors unlike any other, it is one of nature's rare beauties. 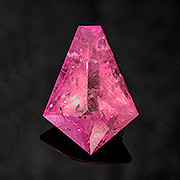 Pezzottaite is a cesium (Cs) rich member of the beryl group. Pezzottaite is in the trigonal crystal system, while beryl falls into the hexagonal system. We just recently picked up the cat's eye pictured above at this summer's Sainte-Marie-aux-Mines show and Pala International's Bill Larson pulled the kite shape out of his personal collection to offer it on the market. Pezzottaite is often included in large sizes, and in the cat's eye those inclusions lined up well enough to create a nice chatoyancy. 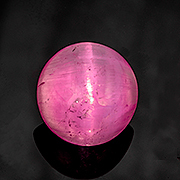 The faceted gem is huge for the species and represents some of the best color to be found. See more on pezzottaite at Gemdat.org.